Three hundred thirty five schools across the nation were recognized as National Blue Ribbon Schools this year, based on overall academic excellence or progress in closing achievement gaps among student subgroups. Haddonfield’s Elizabeth Haddon Elementary School was named one of those schools. U.S. Secretary of Education Arne Duncan recognized Elizabeth Haddon as a 2015 National Blue Ribbon School on Sept. 29. Of 285 public schools recognized as National Blue Ribbon Schools, Elizabeth Haddon is just one of 15 schools across New Jersey to receive this award and just one of eight elementary schools across the state. “This is a great honor for our school and embodies the collaborative efforts between faculty, administrators and families to make Elizabeth Haddon a special place for children to learn and grow,” Principal Gerry Bissinger said in a press release. The National Blue Ribbon Schools Program honors public and private elementary, middle and high schools where students either achieve very high learning standards or are making notable improvements in closing the achievement gap. Elizabeth Haddon was recognized as an exemplary high performing school. These schools are among their state’s highest performing schools as measured by state assessments or nationally normed tests. A total of 420 schools nationwide may be nominated for a National Blue Ribbon, with allocations determined by the numbers of K-12 students and schools in each jurisdiction. The U.S. secretary of education invites nominated schools to submit an application. A committee of teachers and the principal worked on the extensive application. Elizabeth Haddon was nominated based on its high NJASK scores. For two years in a row, the school has been named a “Reward School” by the state Department of Education for its NJASK achievements. The committee members who worked on the application for Elizabeth Haddon were Bissinger, Vince DelDuca, Lynn Green, Cristina Kaubin, Victoria Karpman, Debbie Landry, Katy Roussos and Emily Weber. “In a five-year range of scores, our percentage of students who were proficient or advanced far exceeded the state average. For the years 2009–2014, we exceeded the percentage of students who were proficient or advanced proficient as compared to the average in our demographic group 17 out of 30 times; this includes 10 out of 15 times in mathematics,” the application read. Bissinger knew about the school achieving the recognition a day before it was announced, but couldn’t say anything until the next day. Once it was announced, he was excited to share it with faculty, administration, students and the community. “It is a great honor and definitely a highlight of my career thus far … I was excited to share it with the kids, faculty and community. 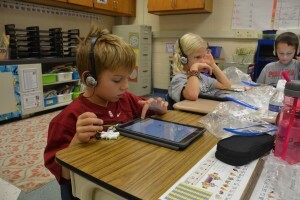 It is a testament to how hard everyone is working together for the students to help them learn and grow,” Bissinger said. To Bissinger, what helped to make Elizabeth Haddon a National Blue Ribbon School is focus on the children, community collaboration and integrating technology into classroom instruction. In keeping the school at a National Blue Ribbon level, Bissinger said he would like to continue to look for ways to be innovative with education and work on things they can do better. “There are a lot of strong traditions [in Haddonfield]. Elizabeth Haddon is a special place … I would just like to continue achieving at a high level and working together to positively impact the students,” Bissinger said. The DOE will honor the schools awarded this year at a recognition ceremony on Nov. 9–10 in Washington, D.C. In its 33-year history, the National Blue Ribbon Schools Program has bestowed this award on more than 8,000 of America’s schools. In December, Elizabeth Haddon will host a pep rally to officially celebrate the achievement. 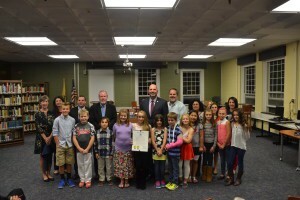 Bissinger, as well as the committee members who worked on the application, also received a commendation at the Haddonfield Board of Education meeting on Oct. 8. To see Elizabeth Haddon’s 2015 National Blue Ribbon School profile, go to nationalblueribbonschools.ed.gov/awardwinners/ and search Elizabeth Haddon School.